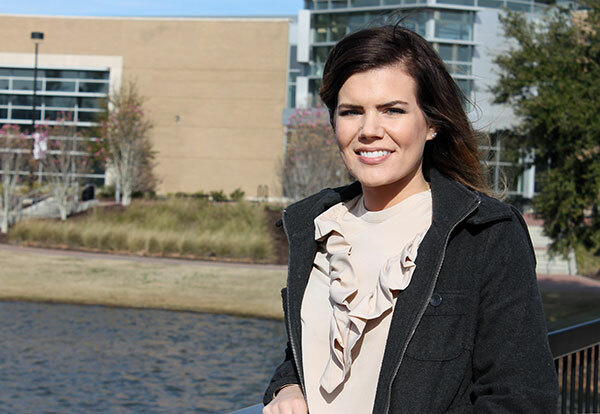 A proud graduate of Middle Georgia State, Mallory Miller now shares her experiences with prospective students as she recruits for the University. Degree: Bachelor of Science, Middle Georgia State University, Class of 2012. Activities: “I grew up in the Middle Georgia area and I devote a lot of time to my church - Rock Springs Church – Macon - where we engage in various forms of community outreach. I lead worship every week and I enjoy encouraging others through that outlet. We also support the Rescue Mission of Middle Georgia, which is a powerful organization that helps get people and families in our community off the streets and provide valuable resources for them. I serve in these ways weekly and it is one of the things I enjoy most – helping our community and giving back. As you travel the state recruiting, what do prospective students you talk to find the most attractive about Middle Georgia State? "People may be surprised that I got the opportunity to sing the National Anthem at a campaign event for then-candidate Donald Trump. Also, I love to record and write music and have an album – 'I Lived This Song' - on iTunes."